Lift 83: 56', 37°, On a Sandy Escarpment. — Inclined Elevation Inc. This is our second lift on Lake Erie. 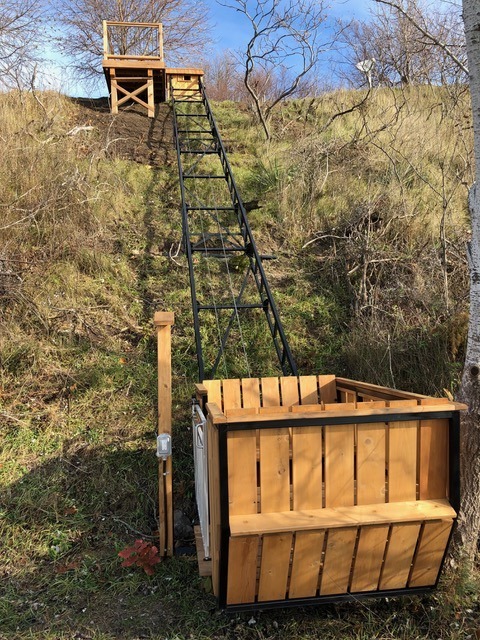 We protect the steep sandy embankments during the build by working off ladders laid on the hillside. This minimizes the damage to the vegetation whose roots help keep the hill stable. The lift fits nicely into one corner of the back yard. Postech Niagra did a beautiful job of building the upper station access platform. The lift fits beautifully into the existing terrain. We attached the lower button box post to the track and the ground and their electrician used the lift to mount a pony panel at the top and an outlet at the bottom. No lower station platform is required. From the water, the track far less visible than the staircase that’s to the left. and as the vegetation grows back in the lift will become less and less visible. The lovely offices of Inclined Elevation for the duration of the build. The build team: Wyatt, John, and Cody. Newer PostLift 84: 105', 20°, Long, Gentle, and Close to the Rock.